There haven't been many heartaches for Justine Washington during her six-decade singing career...unless failing to become a household name should cause an occasional painful palpitation. But she's been able to have her cake and eat it too, with more than 60 singles released between 1956 and 1978, no less than 20 of them finding their way onto one national popularity chart or another. 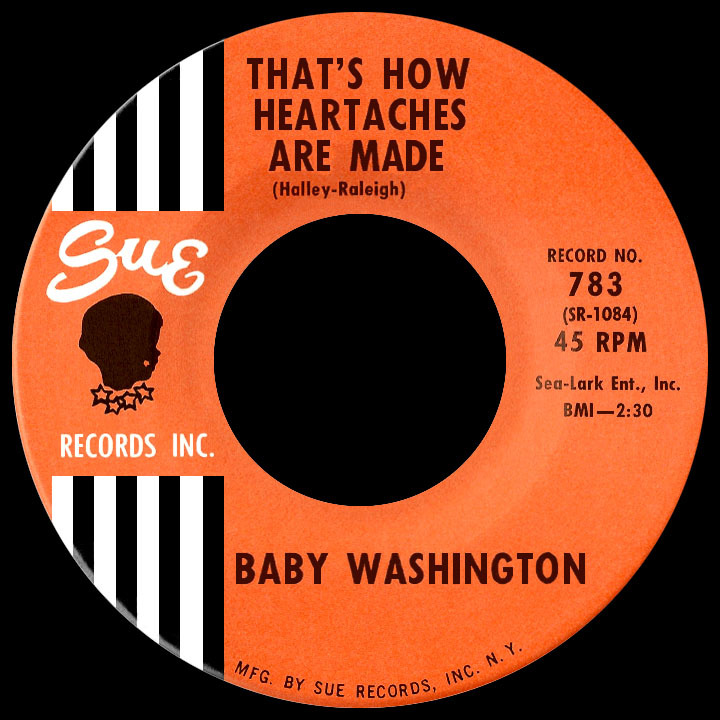 Throughout her 1960s heyday and for a few years afterwards, soul-formatted radio stations dotted the stateside terrain and her songs received regular spins on the majority of them while "That's How Heartaches Are Made" and a few others achieved more widespread exposure at top 40 outlets. Since then she's performed for audiences at whim, her natural contralto-range vocal prowess nearly as strong during her senior years as when she first emerged at age 15. Zell Sanders, one of the few women on the New York music scene with her own record label, had assembled a group of teenage hopefuls and christened them The Hearts. They scored a top ten rhythm and blues hit in the spring of 1955 with the deliciously assertive "Lonely Nights" on the Baton label. The lineup, usually consisting of four members, changed quite frequently according to Sanders' high standards and aversion to putting up with any inflated egos that might arise within the ranks. Justine, a strong singer with a mature sound, filled an opening for lead vocalist towards the end of 1956. 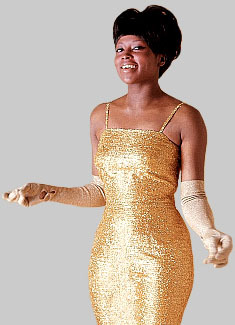 Born in Bamberg, South Carolina in 1940, she studied piano as a youngster; the desire to break into showbiz developed after her family moved to Harlem. Because she was the youngest of the Hearts, the nickname "Baby" took hold...and stuck to her like glue for life, despite one or two attempts at dropping it. "Going Home to Stay," penned by Sanders and issued on her J&S label, made for a superb debut for Washington, her confident lead on the Hearts' recording consistent with the earlier hit. Additional 1957 singles ("Dancing in a Dreamworld," "You Say You Love Me") followed the same approach, yet varied in quality. "I Wanted to Be Free" was attributed to a different group, The Jaynetts, though they were actually the Justine-led Hearts; Sanders would reuse the name from time to time (five years later, "Sally, Go 'Round the Roses" was a major hit by a different lineup of Jaynetts). 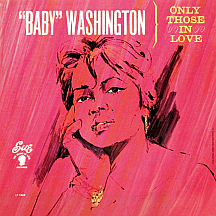 Solo Baby Washington singles appeared on J&S in 1958 including the uptempo "Congratulations Honey" and a ballad, "Ah-Ha." Certain things about "Baby" would soon be more clear: ballads were her stong suit...and she was quite capable of writing good romantic songs, often dealing with feelings of heartbreak and despair. In late 1958, Justine joined Donald Shaw's Newark, New Jersey-based Neptune label (which was affiliated with J&S by way of the same distributor). Shaw allowed her the opportunity of recording her own songs, resulting in an R&B chart hit on the first try in January '59: "The Time," a haunting number that blames a lost love on the inevitable ticking passage. Sanders countered by putting out an earlier song, "I Hate to See You Go," first on J&S and then on Chess for a shot at the national success Washington had just received, but it wasn't to be and Baby's former bosslady made no further attempts. "The Bells (On Our Wedding Day)" contained a joyous message of love's union by songwriter Joe Hicks and made Baby two-for-two on Neptune when it reached the R&B top 20 that summer. Girl group The De Vaurs provided backing vocals on this and a few other singles and in 1963 they had a minor hit of their own, "How Much is That Doggie in the Window," as Baby Jane and the Rockabyes. In trying to rid herself of the "Baby" nickname, a new professional moniker, Jeanette Washington, somehow came out of thin air. One 45 appeared under Jeanette B. Washington, then the label went with Jeanette (Baby) Washington; under this name, in the spring of '61, she crossed to the Hot 100 charts for the first time with "Nobody Cares (about me)," conveying the lovelorn theme often found in her lyrics ('...when the tears fall from my eyes...do you think anyone would stop and ask me the reason why? No!'). Despite this being the top-selling Neptune record to date, it wasn't enough to prevent Shaw from calling it quits less than three years after starting the label. Signing with ABC-Paramount (one of the most proactive of the large labels when it came to securing top talent for its roster), she had two singles as Jeanette "Baby" Washington including "Let Love Go By," an infectious but puzzlingly overlooked self-penned track. Within months, Baby (Jeanette no more) had to make another move. Sue Records owner Henry "Juggy" Murray, a fan of her earlier material, jumped at the chance to sign her. 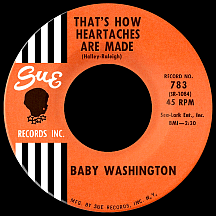 Of the first three singles, "Handful of Memories" (arranged by Sammy Lowe, a trumpeter with the Erskine Hawkins band in the '40s) returned her to the R&B top 20 in September '62. Then longtime N.Y. producer-songwriter Bert Keyes brought in a string section as he helmed the first session of what became her peak period. "That's How Heartaches Are Made," a Bob Halley-Ben Raleigh tearjerker ('I know you're not sincere and you'll never be...but still I want your kisses so desperately...'), was added to top 40 playlists throughout the east, west and south in the spring of 1963 in numbers previously out of reach, resulting in her biggest hit, the first to enter the R&B top ten and only single to make the national pop top 40. A Billboard magazine review of the song referred to her as the "little girl with a big voice." The simple reference was right on point. Most of her material after this time came from outside contributors, slighting Baby's competence as a songwriter, perhaps, but it was understandable as Juggy sought to raise her star profile a few notches. "Leave Me Alone," written by the successful songwriting team of Larry Weiss and Lockie Edwards with newcomer Mat Paul Maurer, maintained a string-sweetened arrangement while hanging onto the heartbreak theme and was a fair-sized hit that has gained greater reknown over the years. Over the next couple of years, several Washington singles ruffled the lower edges of the charts: "Hey Lonely One," Baby-penned originals "I Can't Wait Until I See My Baby's Face" (crediting Justine Washington, sans Baby, one last time), "The Clock," "It'll Never Be Over for Me" and "Run My Heart." Another career high came with "Only Those in Love," an instrumental by German composer-bandleader-"Wonderland by Night" hitmaker Bert Kaempfert with lyrics added by Charles Singleton; Baby's soft, soulful rendition returned her to the R&B top ten in August 1965. Then in 1967 Juggy Murray, in financial straits, sold Baby's contract and masters to United Artists, where she was placed on its Veep subsidiary. "Hold Back the Dawn," another Kaempfert song, had an impressive pop arrangement but failed to make any waves. Murray's Sue Records had been a safe haven for Washington, but there was no choice but to keep trying. She had a brief stint at Cotillion with a minor summer '69 single, "I Don't Know," and a cover of Dusty Springfield's "Breakfast in Bed" (London-to-Memphis songstress Springfield had already demonstrated her admiration for Washington's work with her own versions of "That's How Heartaches Are Made" and a slightly retitled "I Can't Wait Until I See My Baby's Face" a few years earlier). After some down time, Baby found a home with a small label, Master Five. In 1973, "Forever" (a decade-old hit by The Marvelettes), a duet with "I Need Your Loving" shouter Don Gardner, returned her to the charts (top-billed, something Don's former singing partner Dee Dee Ford never managed). Baby stayed with Master Five through 1978 and landed on the retitled Soul charts with three more singles including Donnie Elbert's "Can't Get Over Losing You." She dabbled in disco (not a particularly good fit) and finally stopped making records. But Justine "Baby" Washington has continued commanding stages large and small ever since.